Students conduct a series of experiments to see how water depth affects pressure. They then develop a model to illustrate how pressure increases in deeper water. 1. Activate prior knowledge by asking students to define pressure and give illustrative examples. Accept several definitions of pressure. Then write the pressure equation (pressure = force/area) on the board and define pressure as the amount of force applied over a specific area. Ask for several volunteers to share examples that illustrate pressure. For example, a student might say “snowshoes versus regular shoes” or “a sharp knife versus a dull knife.” After you write each example on the board, ask students to explain how the example illustrates pressure. If students do not offer examples involving fluids, encourage them to do so. For example, they might mention the pressure a person feels in their ears when they dive deep under water or when they fly in a plane. Refer students to the pressure equation on the board. Ask: What would happen to the pressure if force increased? (The pressure would increase.) What would happen to pressure if the area increased? (The pressure would decrease.) How would you describe the relationship between pressure and force? (Pressure and force are directly proportional; pressure increases proportionally with an increase in force.) How would you describe the relationship between pressure and area? (Pressure and area are inversely proportional; pressure decreases proportionally with an increase in area.) For example, the force a person exerts on snow when walking on it is the person’s weight. Snowshoes spread this force out over a greater area than regular shoes; therefore, less pressure is applied to the snow. Explain that in this activity, students will be examining pressure in a fluid, specifically water, more closely. Leave the equation on the board for students’ reference throughout the activity. 2. 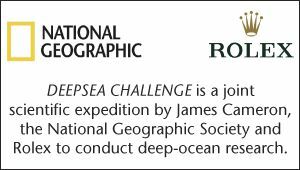 Introduce the DEEPSEA CHALLENGE expedition. Where did the submersible dive? What effect did pressure have on the submersible under water? Why was the dive important? 3. Have students conduct a demonstration to examine how pressure changes in different depths of water. Divide students into small groups. Distribute the Demonstration 1: Pressure Streams worksheet and the materials listed on that worksheet to each group. Review the procedure described on the worksheet with students and answer any questions. Have students make a prediction, conduct the demonstration, and record their data and observations as described on the worksheet. 4. Review with students how and why the two streams were different in the Demonstration 1: Pressure Streams activity. When students have completed the demonstration, ask them to share their results with the class. Ask: What did you observe? Did it match your predictions? How can you explain what you saw in terms of pressure? (The water exited the bottom hole with more force because there was greater pressure at that depth due to the greater mass of the water above that point. Since the pressure was greater at that depth and the area over which it was applied (the size of the hole) was the same at both depths, the force with which the water exited the bottom hole was greater than the force with which it exited the top hole.) Make sure that students can properly explain what they observed in terms of force and pressure. If necessary, illustrate this to the class using specific variables from the pressure and force equations: Go back to the pressure equation you wrote on the board (pressure = force/area). Go through each variable in the equation as it relates to the bottom hole in the demonstration; then repeat for the top hole. Pressure at the bottom hole was greater than pressure at the top hole because force was greater at the bottom hole and area stayed the same. 5. Have students conduct Demonstration 2: Measuring Pressure. Distribute to each group the Demonstration 2: Measuring Pressure worksheet and the supplies listed on the worksheet. Have each group assemble a manometer as described in the Demonstration 2: Measuring Pressure worksheet. Be sure students understand that as the pressure increases, the level of the water will rise on the right side of the ruler. Have students discuss what they think will happen to the pressure as they lower the funnel in the water, and ask them to record their predictions on the worksheet. Have them test the pressure at several different levels and record the results on the worksheet. Also have students test with the funnel facing in different directions at the same depth and note any differences. 6. Discuss how the measurements changed with depth in Demonstration 2: Measuring Pressure. Ask groups to share what they observed in this demonstration. Ask students to explain why the pressure increased as depth increased and to explain why the pressure reading was the same no matter which direction the funnel faced. Identify and address any misconceptions about pressure in fluids at this time. Common misconceptions include the idea that pressure only occurs during movement and that pressure is only applied downward. To address these misconceptions, ask: What would happen if a hole opened on the side of Cameron’s submersible while it was descending to the bottom of the ocean? What if the hole opened while the submersible was sitting still at the bottom of the ocean? Guide students to answer that both situations would lead to an inrush of water. 7. Show students the "Cameron’s Long Way Down: Mariana Trench" video, which includes a one-minute video recap of James Cameron’s dive to the Mariana Trench. Prior to viewing the video, ask students to note the pressure changes during Cameron’s descent. Explain that the pressure is different at different locations. Brainstorm some factors that would influence how much pressure is felt at different locations both above and below sea level. Divide students into pairs, and distribute the Calculating Pressure worksheet. Give students the rule-of-thumb calculation for pressure underwater: pressure increases by 0.445 psi per foot of water. The total pressure on an object underwater also includes air pressure, so 14.7 psi—the standard air pressure at sea level— must be added to each of the students' underwater calculations. Have students calculate and record the pressure for the locations on the table. Review the table and discuss the data. 8. Have students create models to show how and why pressure increases at greater depths in the ocean. Explain that students will work with their partners to develop models to show how and why pressure increases at greater depths in the ocean. Tell students that the models could be illustrations, physical models, or demonstrations, but that they also must be able to use the models to explain how and why pressure increases as depth increases. Distribute the Exploring Pressure Model Rubric and review it with students to be sure they understand what is expected of them in this activity. Make available to students an assortment of materials such as packing peanuts, balloons, marshmallows, Styrofoam balls, and other items. Once students have created their models, have them present the models to the class. Use students’ written predictions and explanations to assess their understanding of pressure throughout the activity and use that information to address any misconceptions. Use the Model Rubric to assess students’ pressure models. Have students use their models to give younger students an introduction to pressure in fluids. If the demonstrations will be done inside, set up the stations with a tray on top of a towel to prevent spills. Pressure is force per a specific unit of area (pressure = force/area). As force increases, pressure increases proportionally. As area increases, pressure decreases proportionally. Pressure can be measured in a variety of units including the pascal (Pa), which is the standard international (SI) unit equivalent to one newton per square meter, or in pounds per square inch (psi). Pressure can be important in describing the behavior of fluids such as air or water. Though we can’t see the individual molecules in air or water, they have mass and therefore exert force. Air pressure and water pressure describe that force acting over a specific area. The water pressure on an object that is under water is proportional to the weight of the water above the object. Liquid pressure also depends on the density of the liquid. However, liquids are practically incompressible, which means the spacing between molecules does not change much with depth, so except for small changes produced by temperature, the density of a given liquid is almost the same at all depths. Therefore, the deeper an object goes under water, the more pressure it is under. This is because as an object goes deeper under water, there is more water above the object, and therefore more weight (force) to add to the pressure. As a rule of thumb, water pressure in seawater increases at a rate of 0.445 psi per foot deep. So an object under 10 feet (3 meters) of water would be under 4.445 psi of water pressure. The total pressure on the object is equal to the atmospheric pressure plus the pressure due to the weight of the water above the object. At sea level the atmospheric pressure is 14.7 psi. Therefore, the total pressure on an object at a depth of 10 feet (3 meters) in sea water would be 14.7 psi + 4.45 psi for a total of 19.15 psi. Air pressure generally decreases with elevation above sea level. The air at higher elevations is generally less dense than at sea level since there are fewer “layers” of air molecules pressing down from above, and the pressure is also correspondingly lower. The lower density of the air at higher elevations also explains why mountain climbers can have trouble getting enough oxygen as they ascend higher and higher. Since there are fewer molecules of oxygen and other gases that make up air at high elevations, mountain climbers have to breathe faster to take in the oxygen they need. increase of speed or velocity. 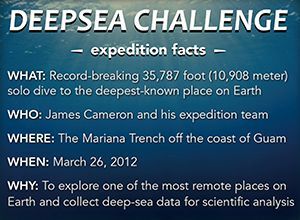 ongoing expedition to study the deepest point in the ocean, with a record-breaking descent to the Challenger Deep in March 2012.